Bring your memories back to life! A clear, easy-to-use user interface combined with unique wizards for automatic optimization, effect design and dubbing makes creating slideshows easier than ever. Import your photos directly from your smartphone or your camera to the program. The Import Wizard will help you select the best images. Optimize your images and remove red eye with just a few clicks. Thanks to over 20 templates and a huge collection of music, it's easy to create your own slideshow. Share your stories exactly the way you want: On CD or DVD, through social networks such as Facebook and YouTube. To tell your story even faster, numerous dialog windows have been optimized for better and more intuitive performance. Give your photos a special look with intense colors and a stunning range of brightness. With even more templates, special effects and music, you can create impressive slideshows in next to no time. Automatically adjust the color, contrast and brightness with auto correction. 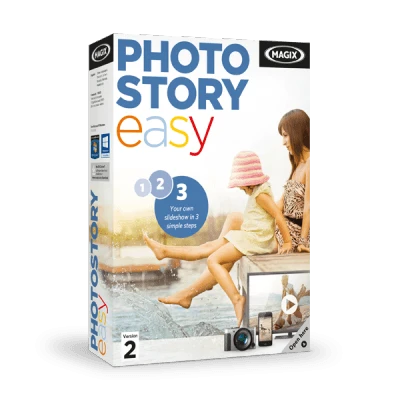 Combine individual images to create seamless panorama pictures. Simply select the style you want and the wizard will take care of the rest. Create appealing CD/DVD cases & labels for your slideshow discs, etc. Internet Connection: Required for activating and validating the program, as well as for some program functions. Software can also be used offline. However, please note that the program requires an Internet connection at least once a month to validate the license. MPEG-2 must be activated for copy protection reasons (free). *AVC(HD)-Import must also be activated (£4.99). Note: The program's internal online services and the online update require an Internet connection.